We are excited to announce that Can You Find Me? has been selected as a Notable Book for 2018 by The Children’s Book Council of Australia. The author, Gordon Winch has been writing widely for 30 years. His work ranges from stories and poetry for children to tertiary publications in the field of literacy. Can You Find Me? looks at the flora and fauna in the Australian landscape, exploring Australian animals and the environment. 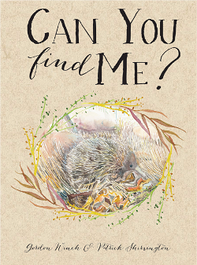 Search for an echidna, a powerful owl, a frog and many more animals hidden on every page. Patrick Shirvington’s striking illustrations hide each one of the animals just enough for the guessing to begin. Patrick Shirvington uses drawing as a means of phenomenology, or simply, how we experience things in nature, not as a panoramic narrative, but as a nexus between the drawn and the natural world. His landscapes have been featured in numerous exhibitions. It is hard to believe that Can You Find Me? is his first picture book. Many congratulations to Gordon Winch and Patrick Shirvington!